Awards & Honours - Our Proud Moments..
Congratulations Dr. Veena Saraf , Associate Professor Rural Dental College, received Best Paper Presentation Award. The award received in 46th Indian Prosthodontics Society Conference held at Manglore, Karnataka during 16-18 November 2018. Congratulations Dr. Deepak Vikhe , Associate Professor Rural Dental College, received Best Paper Presentation Award and PRof TR Sarawati Medal Research Award. The awarded received in 31 St ISDr International Conference , Mumbai during September 27-30, 2018. 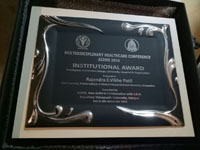 Pravara Institute of Medical Sciences (DU) was awarded Best Institutional Award at Multihealthcare conference of AIIMS, Delhi on 6th November 2016. Award was given with the hands of Hon.Minister of State for Health & Family Welfare Smt. Anupriya Patel. Congratulations Dr S C Deorukhkar , Asst. Professor received "Chancellor Rolling Trophy" of PIMS-DU for excellence in research on 29/9/2016. Heartiest Congratulations to Mili Ashar, Liz Thaliath, Kimaya Sali, Sonali Pinge, Tanaya Kulkarni - III/II MBBS student of Rural Medical College, Loni . Congratulations for securing 3rd Prize for “Poster Presentation” and 2nd prize for “Cinemedics “ at MediAce 2016” - a National Level Medical Research Conference organized by Kashibai Navale Medical College & General Hospital, Pune, from 20th & 21st August 2016.